GRISWOLD – A Griswold mother is hoping to turn a family tragedy into something positive. Last November, Kathleen Dufficy’s son died in a car crash. Matthew Barrett was 32 and Dufficy learned he had heroin, methadone and klonopin in his system at the time of the crash. But the findings weren’t a surprise to her. Barrett had been battling a heroin addiction for 12 years. “I knew his addiction would end one of three ways: Incarceration, death, or he would enter a long-term treatment facility,” Dufficy said. 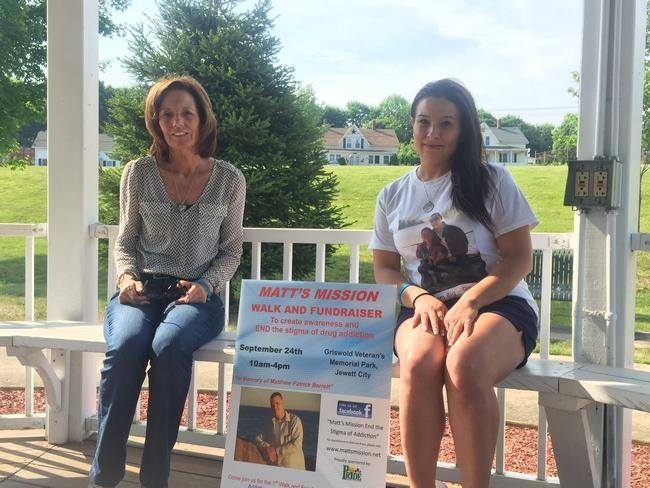 This year, Dufficy and her daughter, Kelly Barrett, as well as Kimberly Cornoyer who was engaged to Barrett, are working to organize Matt’s Mission, a walk and fundraiser this September, in memory of her son. “I wanted to channel my grief into something positive to possibly help other people,” Dufficy said. The goal of Matt’s Mission is to end the stigma of addiction. Speakers familiar with the struggles of addiction are expected to be at the event with the goal of breaking down barriers and the shame that comes with addiction, Dufficy said. “We want people to come down here and learn what addiction is. Whether it be a talk with a person who is struggling and listening to their story. They have to be willing to open up and listen,” Cornoyer said. Her son was belittled, criticized and disgraced because of his addiction, Dufficy said, which ultimately prevented him from seeking help. Dufficy will hold fundraisers before September to benefit local drug prevention and awareness groups such as Griswold PRIDE. Through Wednesday, people can purchase a Matt’s Mission T-shirt to wear to September’s walk. Proceeds will go to Griswold PRIDE. Miranda Nagle, with Griswold PRIDE, said the walk may be the start of something bigger. And so far, Dufficy’s efforts have received national attention – a photographer for Getty Images has expressed interest in attending the walk in September.